A German course in the Turkish city of Balıkesir is the starting point for this long-term observation. The participants learn German because they want to marry a Turkish man living in Germany and move in with him. The film accompanies three women from this course on their way from Turkey to Germany, into a new life. The film tells the story from a women's perspective. 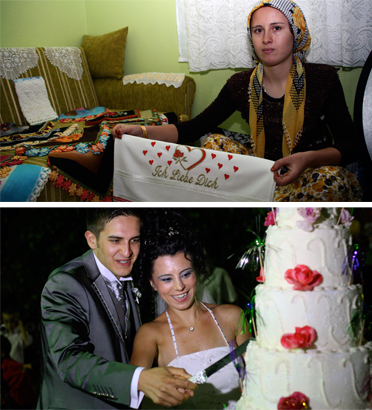 Seher (24), Sümeyra (21) and Durdu (20) are deep in love when we meet them for the first time in Turkey. Her future men were born and raised in Germany. In the film, the three women tell how they met each other. Seher's husband and his family came from Germany in the summer and spent their vacations in the same village as their parents. The marriages of Sümeyra and Durdu were mediated by the families; first they spoke on the phone with their future husbands for a while, and then at the first meeting they fell in love. None of the three women have ever been to Germany, and their future husbands have not told them much about their lives there. Their families once came to Germany as guest workers - and stayed. Experts call this "marriage migration", which the young women are looking forward to. Only with proof of German language skills can women obtain a visa to enter Germany. The German Residence Act has been prescribing it for several years now. We were there when the women were practicing the first few words of German, we experienced how difficult it was for them, because they had never before learned a foreign language. We have seen how they live in Turkey, where they grew up, how different life is in the city and in the countryside. After three months we were trembling when our protagonists took their test at the Goethe-Institut on which their future depends. In Germany we met the young wives again. One year after passing the language test in Turkey, all three speak less German than they did in Turkey. Only Sümeyra goes to another language course right after arrival. Seher has to wait more than six months until a suitable course begins in St. Ingbert, her new home. The meaning of language is at the centre of the film. The language problems become tangible, we can't work without an interpreter until the end. And even the first generation still speaks German poorly. When they arrived, language skills were ignored. 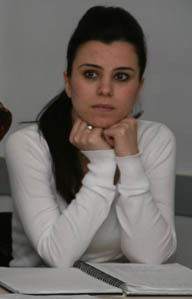 Without using stereotypes and prejudices, the film offers the chance to get to know the young women from Turkey. The audience can form their own impressions, people and scenes speak for themselves. Happy, in love and full of anticipation for the future, that's how we experienced the women in Turkey. Only after their arrival here in Germany they realize that it is difficult to realize their desire to work. Homesickness is one of their major problems, but language problems are the main obstacle to prevent them from exploring their new environment. Seher has worked as a saleswoman in Turkey and likes to meet with friends in a café, in Germany she doesn't dare to go out alone. In Turkey, the Almancılar (Turks living in Germany) are considered rich. They spend a lot of money on weddings and are otherwise generous when they come to their old homeland on holiday. Only in Germany does one of our protagonists find out that her husband is unemployed. The film is available in a German-Turkish language version, the Turkish original tones are subtitled in German, the German ones in Turkish. Thus, even Turks with poor or no knowledge of German can understand the film. Funded by "Stiftung Rheinland-Pfalz für Kultur","Hessische Filmförderung" and "Filmstiftung Nordrhein-Westfalen".